This year marks the 80th anniversary of Campagnolo S.r.l., based in Vicenza, Italy. Six years after company patriarch Tullio struggled with frozen wing nuts in an effort to flip his rear wheel while leading the 1927 GP della Vittoria on the Croce d'Aune in the Dolomites—muttering 'Bisogno cambiá qualcossa de drio!' (Something must change in the rear! )'—the quick-release lever was born, launching what is now a $150-million corporation supported by tifosi around the world. I've owned two bikes with a Campy Record gruppo, and am about to take delivery of a Super Record-equipped 2014 Trek Series 7 Madone to prepare for my maiden voyage during L'Etape du Tour in Annecy, France July 7. I've only been alive 47 of those 80 years, and wanted to learn more about the fabled Italian company and its current leadership. Tullio passed away on February 3, 1983, just as the company began celebrating 50 years in business. On June 15, Gruppo Number 0002 of Campy's 50th anniversary set was presented to Pope John Paul II in a private audience with a delegation of Italian cycling enthusiasts. Tullio's son Valentino, 33, took over leadership of the company just as the mountain bike craze was building, and Laurent Fignon won his first Tour de France on rival Simplex components; Fignon switched to Campy in 1984, again wearing yellow to Paris. Valentino knew what he had to do to stake his company's reputation for racing excellence firmly in the ground. Beginning in 1968 with Jan Janssen, nearly every Tour winner through 1998 rode Campy; only Bernard Thévenet (’75, ’77 on Simplex), Laurent Fignon (’83, also Simplex) and Greg LeMond (’89 on Mavic) rode something else. All told, 40 Tours de France have been won on Campagnolo. Simplex has won 10 for second place, and Shimano is in third, with four victories. The last world road champion to win with Campagnolo was Cadel Evans on board his Canyon for Davitamon-Lotto in late 2009. Spaniard Oscar Pereiro was the last Tour winner on Campy in 2006; the first was Gino Bartali in 1948. Eddy Merckx, the winningest cyclist of all time with 525 victories, raced exclusively on Campagnolo, and was close to Tullio. Today, Valentino considers Campagnolo's sponsorship of five WorldTour teams—Astana, Vacansoleil-DCM, Movistar, Ag2r-La Mondiale, and Lotto-Belisol—essential to the success of his company. Astana's Vincenzo Nibali won the 2013 Giro d'Italia on a Specialized equipped with the 80th Anniversary Super Record groupset; Ag2r-La Mondiale's Carlos Betancur earned best young rider, while Lotto-Belisol's Adam Hansen won stage 7. The crowning glory was Movistar's four stage victories, including Giovanni Visconti's stage 17 win in Vicenza, on the day Campagnolo hosted its 80th anniversary party. 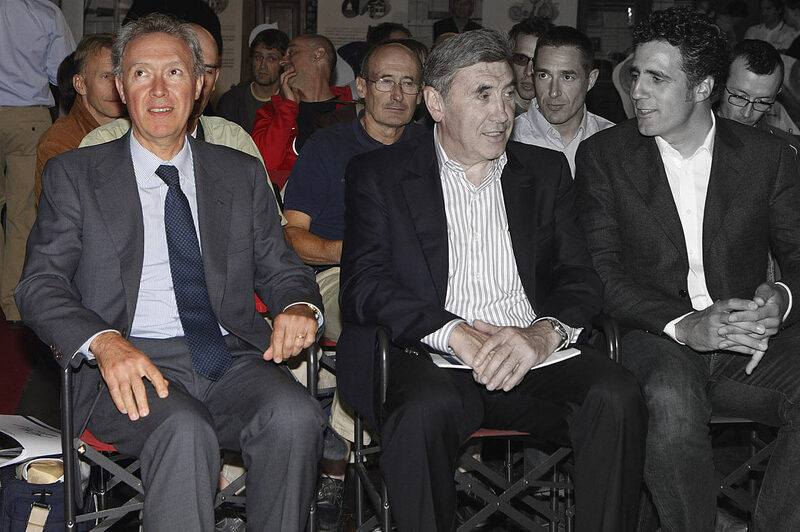 Having claimed his second win of the race, the Italian visited Campagnolo to celebrate with Valentino, his family and a selection of the company's guests and employees. 1. In 1964, the Campagnolo Valentino low-cost rear derailleur is introduced, along with the Valentino low-cost front derailleur and obscure large flange track hubs with curved lever quick releases. 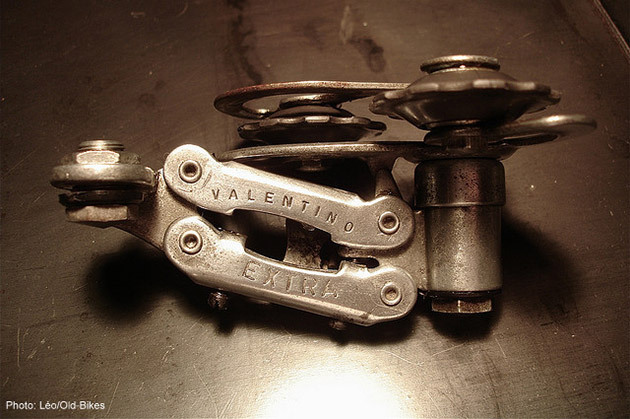 The Valentino Extra low-cost rear derailleur is introduced at the Paris trade show in October 1968. The gruppo survived into the `70s. 2. In 1987, when Mike Brown was selling for Ten Speed Drive Imports, he traveled to Italy to see some Italian brands in person: Rossin, Vittoria, Guerciotti and of course, Campagnolo. "Our tour of the Campy factory included lunch with the workers," he told me. "A bottle of grappa was given to each of us as a token of Valentino's thanks. 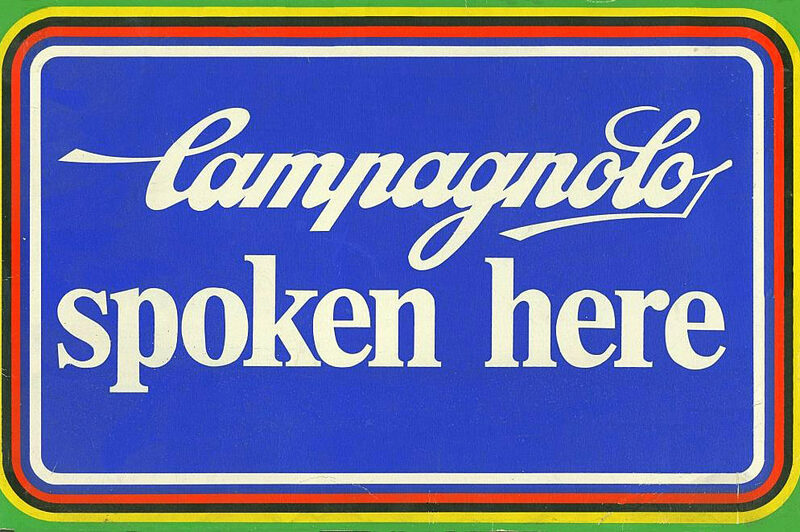 So, why do I have a hand-painted CAMPAGNOLO sign in my store? Because no one else of his stature has ever asked me to lunch, nor have they grown up with the history that is Campagnolo. As long as I ride a bike it will always be a Campagnolo bike. It's in the soul of the company, from Valentino down to the person boxing the components." I also lay claim to owning one of the limited-edition bronze Campy belt buckles produced by True Distance Inc. of Houston, Texas in 1980. 4. Prior to our big ride on the first day of my Gentleman's Training Camp with Brown and Brent Steelman in Paso Robles this past March, Brown spun a yarn based on his experience riding the 2008 Campagnolo Gran Fondo in Italy, cycling's holy ground. The 216-kilometer route included six slopes—Forcella Franche, Passo Duran, Passo Valles, Forcella Staulanza, Passo Rolle, and Passo Croce d'Aune—and 17,060 feet of elevation. It was hard, so hard, but the scenery was forever. At the finish, Brown noticed Valentino standing by himself. Brown extended his hand and thanked Valentino for organizing the event, to which the Italian replied: 'Did you enjoy the suffer?' Here's the link for anyone interested in enjoying the suffer this October. 5. First-mover status takes a backseat in Vicenza, based on Valentino's edict that mirrors his father's decades later. "The bicycle has evolved greatly, especially in the last 10 to 15 years, and even more in the past five years," Valentino said at the 80th anniversary celebration. "We can expect that evolution to continue and we need to be able to follow or, even better, to try and anticipate the evolution. But, everything has to be based on performance and reliability. Sometimes we need to be able to anticipate the future needs of the market; this is a tough job. But staying behind racers and being willing to listen to their experiences, to the reasons why they lost a race, will see us continue to develop. That is the difference for Campagnolo." Campagnolo spent 20 years developing its EPS electronic groupset, with the eventual launch of Super Record EPS and Record EPS coming in 2011, two years after Shimano Dura-Ace Di2.